What type of marketing yields the best ROI, drives more sales and offers a small business owner the most control over results? Below is a simple side-by-side comparison we worked up to hopefully illustrate some of the pros and cons of traditional vs digital marketing. Clients ask my opinion on direct mail, print and various other forms of traditional marketing pretty often. It doesn’t some up as often as it used to, but it’s still a regular point of conversation, so I wanted to address it. To be clear, we use traditional marketing methods here at DT Business Strategies. In fact, there’s a direct mail campaign going out here in the next week or two. But I’m still seeing companies choose billboards and other methods to the EXCLUSION of optimizing their web presence. As opposed to investing in the creation and optimization of an asset (such as a website, a lead gen campaign, etc) that will bring in business and build awareness for their small business for years to come, they’ll spend the same amount of money to run a billboard for 2-3 months. And then complain that their business still needs more sales. I would never argue that your business doesn’t need a presence in traditional channels like newspaper and other local print campaigns, direct mail, radio, etc. But the web is what ties all those channels together and provides synergy. If you want to discuss the pros and cons of traditional vs digital marketing, how all the pieces work together and how to strategically pick where to focus, you know how to reach me! With so many tools at our disposal these days, it’s difficult to know where to focus. You are likely aware of and maybe even using some of these, perhaps all of them. But what kind of results are you getting? Do you have a cohesive strategy? Or is it mostly a collection of parts, and you’re not sure how they all fit together. While there’s definitely some complexity missing from this outline, it gives a snapshot of where bottom line results come from. It ties everything together and demonstrates the role each and everything we do plays toward growing the business. Without a tool like this, it’s far to easy to get really busy doing everything you’re “supposed” to be doing but have no overall vision of how all the pieces fit together. It’s not enough to “be on Facebook”. What are you DOING with it? What RESULTS are you getting? And what results SHOULD you be expecting? Do you have a strategy in place to engage your prospects, track results and continually review your results, so you can ensure you’re growing? We have enough tools at our disposal now that we can spend all day every day working and still have nothing to show for it. While social media, blogging and email represent massive opportunity for your business, if you’re not putting these tools to their highest and best use, they can end up being a liability instead of an asset. 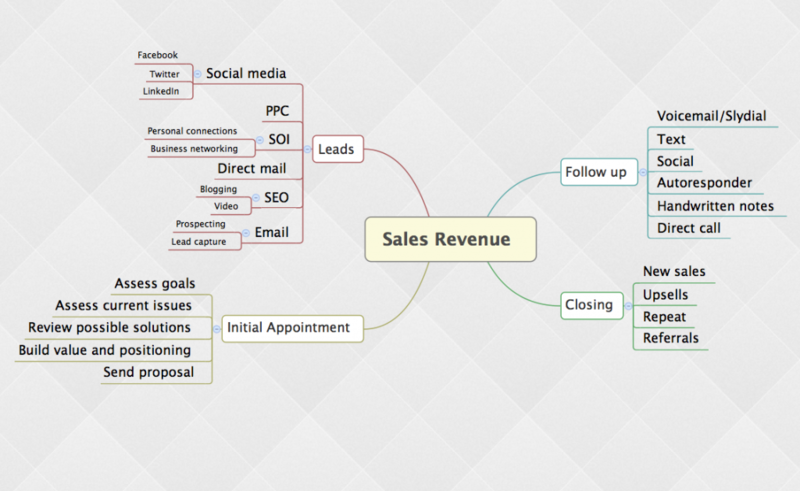 If you’d like to grab a copy of this marketing outline that we use, download it here. Here I am again. 10:39PM. Two more proposals to get out tonight before I can call it a day. I have a weight training session at 5am, and I have my first business call at 8am. It’s an honor and a privilege to work with the most amazing clients. Amy Stoehr, Linda McLean, Whitedove Gannon, Amy Seedorff, David Hood, Brian Russell, Sherrie Cocanower, TJ Blevins, Emanny Seele. These are clients I’ve talked with personally just in the last 24 hrs. Just in the last day, we’ve come up with creative new solutions to challenges, pushed out 47 updates to improve performance and security for our clients’ websites, not to mention 104 one-on-one messages out to prospects, clients and vendors. What are you doing to step up? I have no ambition to brag here. I’m simply sharing what I’m up to, making every attempt to walk the walk. It’s as simple as this. It’s what I talk about with you in consulting sessions. I’m talking into my iPhone, and in 20 seconds this will be live on the web. If you think you don’t have time to blog, you just don’t know how to do it yet. I’m happy to show you. If you think it’s not worth your time, you just don’t understand it yet. Let’s chat. With as fast as things are changing, this has to be considered the new norm. We are out of our element. All of us. Hustling to make a difference. Hustling to do what matters. Hustling matters. Hustling with the right tools in the right strategy makes an impact. That’s what I’m about. That’s from focusing on. Making an impact. As we go through life, we’re confronted with innumerable decisions. We make over 3,000 decisions per day, whether we realize it or not. Most of these decisions are made by our rote mental faculties, but these decisions still consume our mental resources. It takes energy to make a decision. That’s why it’s important to be a good decision maker. When a decision involves money, we put it in a special category. We mark it as important. We think about it. We spend more time on it. We want to get input from friends and family. We want to wait for the right time. We make tens…even hundreds of thousands of other decisions in a split second. But when money is involved, we hesitate. This is important to realize. And it’s understandable. Money is a limited resource. Whether you’re flat broke or a multimillionaire, money is finite. And it always will be. We need to make our financial decisions carefully. But what many of us forget is that we have a resource even more limited than money. If we want to grow to our maximum potential as business owners and contributors to our communities, we need to value our time above all else. Time is even more finite than money. Therefore, please do hesitate. Make your financial decisions carefully. But don’t put your dreams on hold for long. If a financial decision is awaiting you, take a deep breath and go for it. One way or another. Listen to yourself. Regardless of when you jump, you’ll ALWAYS have that knot in the pit of your stomach. It would be unhealthy if you didn’t! But make the decision anyway. Push for your dreams. They require it, and they’re worth it. Commit to one direction or another. You can ALWAYS make more money, but if you spend days, weeks or months…dare I say years…deliberating on a financial decision, that time is gone. Forever. Dreams are made into reality every day. Every. Single. Day. No matter what time of year it is, no matter where you are in your career, no matter what your friends or colleagues say, you are the decision maker. This is your life, your career, your ambition. Listen to your advisers and mentors, but don’t forget to listen to yourself as well. What does your gut say, right now? Make the decision carefully, but make the decision in a way that’s in alignment with how much you value your time. Yea or nay, take time out of the equation…and go for it. Make your goals a reality…starting now.